Launch Outlook and click Next. The next screen will allow you to setup your SureMail™ account automatically. On this screen you should enter your name, your email address and your SureMail™ password. 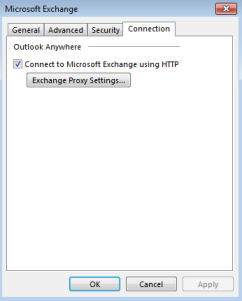 Outlook should now ask for your password again. 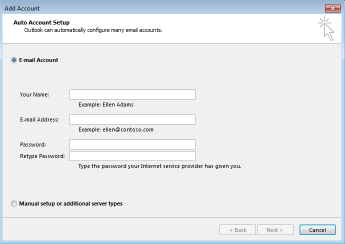 Put in your SureMail™ and click Save Password. If the automatic creation failed make sure you used the correct username and password. If it still does not work follow the below steps. Select Manual setup or additonal server types and click Next. 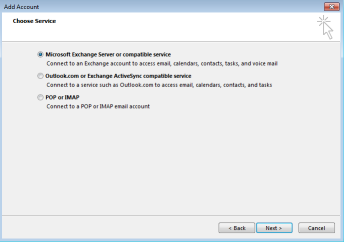 Select Micosoft Exchange Server or compatible service and click Next. Type in mail.thoughtbus.com for Server field.Type in your email for User Name. Under Connection settings field type mail.thoughtbus.com. 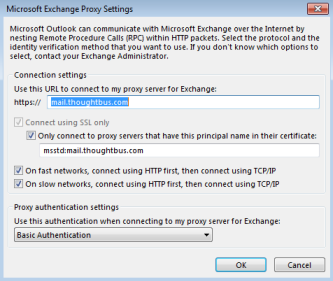 After selecting Only connect to proxy servers that have thus pricipal name in thier certificate: type msstd:mail.thoughbus.com. Select Basic Authentication from the drop down menu and click Ok.